In Mediatility 0.985 the mp4box version was buggy. In Mediatility 0.986 a chapter editor was added. In 0.987 a metadata editor was added. In 0.999 an international grabber was added. I started the work on Mediatility, because I don't like any kind of advertising. My aversion to marketing in film and television has has led me to OnlineTvRecorder.com a german television recording service for less money. By this service one can accommodate from 134 channels TV programs and download ad-free after the broadcast. Program support for Mac OS X is very good, but because of the concept the delivery of high-resolution records in AVI format (rather than mp4, mkv, mov) is a problem. AVI basically do not provide video tracks in the highly efficient H.264 video codec and certainly no variable frame rates. So they had to resort to tricks to make it possible. If you only want to bring such a fiddled AVI file into another container format, in my case it was / is the MP4 format. You just can not multiplex the file only. First you have to extract the video and audio tracks as raw files. Secondly convert MP3 audio to AAC audio and then you can both tracks reconnect again. The whole procedure takes only a few minutes at a 90 min. HD movie. At the very beginning I didn't know this process and converted the AVI to MP4 files with changing programs with little to no success. Over time, I read much about the topic and have found in the search results some freely available programs. 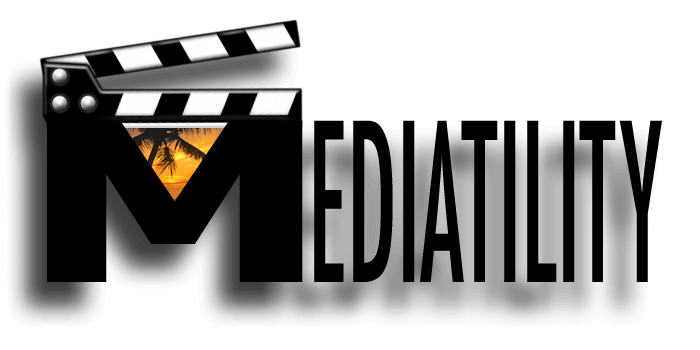 With the media-specific free console applications ffmpeg, mp4box and mkvmerge I was able to solve most of my requirements for the handling and management of my films satisfactorily. Because I like to use computers as tools, I thought it would be a good idea to concentrate the various procedures under a GUI. After a thorough study of for OSX available options, I've found Pashua, a good utility for generating customized GUI's on mac. 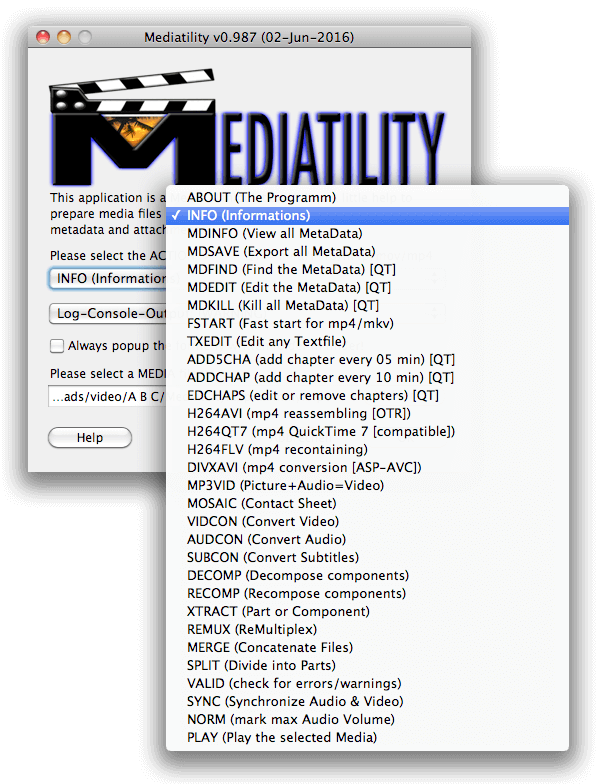 Mediatility is designed primarily to the container and codec format MP4. Compatibility to QuickTime 7 and QuickTime X is the primary goal. AVI, Matroška and all other available QuickTime formats (mov, mv4, mpeg usw.) are of secondary importance. 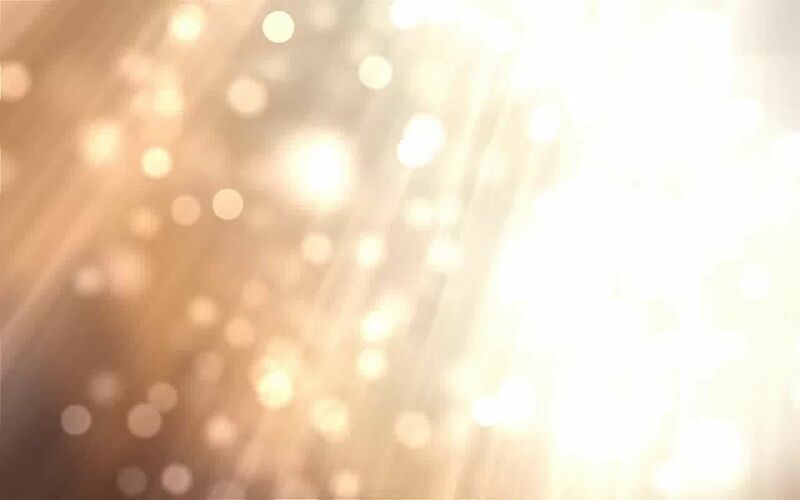 Quite usual formats like ASF, FLV, OGG, SWF, VOB and WebM are only a third-rate. Mediatility already contains the most important software packages in the latest OS X 10.6 version. Plus, or optional packages to be installed can be found at the menu item ABOUT (The Programm) and should be considered to promote full functionality. All offered actions need (as long as not specifically noted) no recalculation of video or audio data. Therefore Mediatility is often the quickest and easiest way to reach the goal. The program is tailored to my personal needs and therefore requires in the near future probably some anticipated adjustments and enhancements.